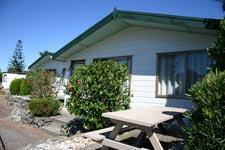 There are two 1 bedroom motels at Pauanui Glade Holiday Park. These motels are a great choice of accommodation for couples with children. A picnic table is placed in front of the motel and a barbecue supplied so you can enjoy your meals outside in the sunshine, taking in the wonderful estuary views from your deck. Sleeping up to 4 people comfortably, the separate bedroom contains a queen bed and the 2 single beds are situated in the lounge space. All bedding, linen and towels are provided and an ironing board and iron are available for your convenience. Upon entering the lounge area you will find a TV and fully equipped kitchen containing a fridge, microwave, freestanding oven and all the cooking utensils you should require. Tea and coffee are complimentary. The bathroom is a separate room with a shower and a vanity unit. The toilet is housed separately in this area. There are also six 2 bedroom units that sleep up to 6 people available from time to time. All have full kitchen, lounge and separate bathroom facilities. Linen can be supplied. Please make inquiries with the office manager for bookings and linen.